The Perfect Solution For Realworld® Accounting Software Users! 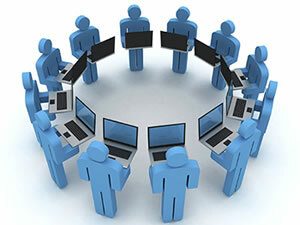 Elliott is the perfect solution for Realworld Software or Realworld Accounting Software users. It will fit your accounting, distribution, and manufacturing needs perfectly since it is similar to Real World Software. 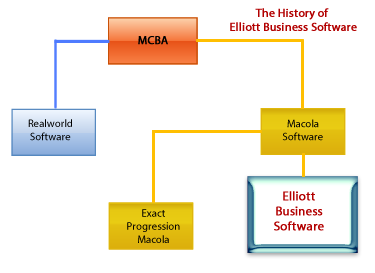 Elliott and Real World Accounting Software originated from MCBA®. Elliott Business Software is a derivative of Macola® Accounting Software, which is also a derivative of MCBA. Elliott Business Software is a Windows 32 and 64 bit application. It is a powerful and feature rich application that is affordable by businesses of any size. Elliott is an integrated solution that includes General Ledger, Accounts Receivable, Accounts Payable, Payroll, Bank Book, Inventory Management, Customer Order Processing, Purchase Order & Receiving, and Bill of Material (Production Manufacturing). 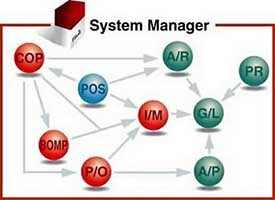 It also provides integrated Customer Relationship Management (CRM) and Warehouse Management features. Features such as eContacts, Ticklers/Task Manager, Events Handling, Inventory Transfer, Multi-Bin, and Shipping Verification will help your business improve customer service and inventory management. Elliott provides an easy migration path from Real World Software and Real World Software / Real World Accounting Software to Elliott. Built right into the application is a conversion utility that will convert Realworld Software / Realworld Accounting Software data to Elliott Business Software. The conversion utility is "Free". Elliott closely resembles Realworld Software. This provides an easy transition for Real World Software and Real World Accounting Software users. The learning curve will be very low. Elliott Business Software and RealWorld Software are written in COBOL. The conversion utility is Free! Elliot®t is a registered trademark of NETcellent System, Inc., Realworld®, Macola®, MCBA®, Pervasive®, Windows®, Micro Focus® and other products and company names mentioned herein are the trademarks of their respective owners.